Tomorrow, and every Wednesday for the past forty years or so, there is an awesome service provided to everyone and anyone who loves to draw. 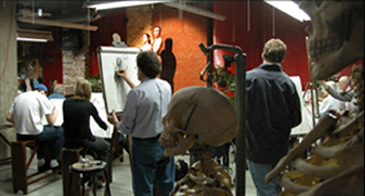 The Drawing Workshop offers drop in live model sessions for $15. I went a few weeks ago for the first time and was thrilled with the set up. They have drawing stools and boards, they have paper if you need it and the model does a series of poses ranging from 20 seconds to 25 minutes. It is so nice to find a classroom environment to do some drawing without having to commit to a weekly class or hefty tuition fees.